The IQ Sensor Net system fitted with the nitralytplus 700 IQ Sensor provides a dip probe measurment of nitrate. The sensor may be mounted directly in a river, a tank or a small breaktank receiving a pumped sample. 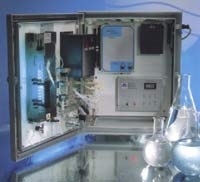 A version is also available to integrate an ion selective ammonium measurement. Whilst the technology has been designed for use within waste water applications such as in aeartion tanks it may also be used on effluents and surface waters. Please send me more information on Nitrate Measurements - probe methodology.